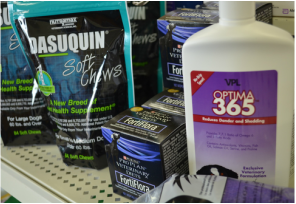 We have all kinds of supplies for your livestock or pet's needs including bandage materials, dewormers, vaccines, syringes and needles, fly control products, flea and tick products, and heartworm preventatives..
We carry healthy treats, collars and leashes, and even a few chew toys for your furry friends. 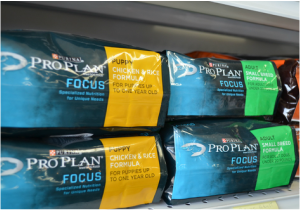 We carry a full line of Purina Pro Plan and Purina Prescription Diets dog and cat foods both for general feeding and for specific dietary or disease conditions. In the U.S., 93 out of the top 100 U.S. all-breed show dogs (according to American Kennel Club statistics) are fed Purina Pro Plan brand dog food. Click on the button below to have food shipped directly to your home! We carry a full line of vaccines to protect your pets, horses and cattle from infectious diseases. From Rabies to Parvo to BVD or West Nile, we will work with you to recommend a customized vaccination program for your dog, cat, horse, cattle, sheep, goat or pig. We research all the products we carry and offer the safest and most effective vaccines available.